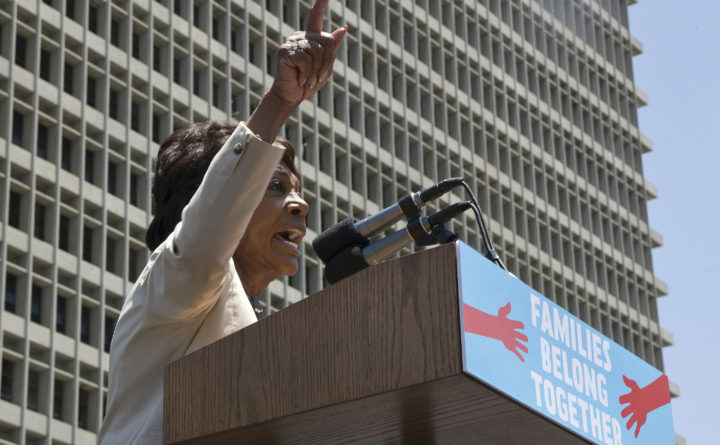 Rep. Maxine Waters, D-California, speaks at the Families Belong Together - Freedom for Immigrants March in downtown Los Angeles, June 30, 2018. In my lifetime I have never seen hate for those who support a president the likes of which I see toward the supporters of President Donald Trump. Maxine Waters is calling on people to publicly harass Trump staffers. Hillary Clinton called us a basket of deplorables, accusing women of supporting Trump only because their husbands told them to. A restaurant owner and staff refused service to a woman because she works in the Trump administration. Even in Charlotte, North Carolina, a Starbucks employee harassed a woman because she supported Trump. City Councilwoman Dimple Ajmera says Trump supporters have no place on our City Council. Is this what the Democratic Party has become? A party of haters? Do Democrats condone this behavior? Please tell me it isn’t so! Yet, I see few Democrats calling to end the behavior that causes such strife and division. I must say, however, that these tactics of the far left are not surprising to me. We have their playbook: “Rules for Radicals” by Saul Alinsky. The left has been playing by his rules for decades. Clinton praised Alinksy in her thesis. President Barack Obama taught Alinsky’s tactics to grass-roots organizations in Chicago. Alinsky’s fifth rule states: “Ridicule is man’s most potent weapon. It is almost impossible to counterattack ridicule. It infuriates the opposition, who then reacts to your advantage.” The desired immediate outcome is for those who voted for Trump to show fear and retreat. I assure you that will not happen. We will not fear or retreat, because we have had enough. The Republican Party is emboldened. Republicans have continually supported and campaigned for dignified, collegial, polite and, yes, polished statesmen. Unfortunately, our Democratic opposition has not offered the same dignified approach. Our candidates from George Bush to Mitt Romney and many others since have not been treated with respect or dignity by the Democratic political machine or their comrades in the media. Trump isn’t always polite, but he has no choice but to push back hard. So we have Donald Trump, a true fighter. He has taken off the gloves and applied the very same fighting style against our opponents. He does not put up with lies. He calls people out. We are fighting back in this war of words with the truth, delivering it with the same hard-hitting rhetoric that our opposition has been using for decades. Is this the party you Democrats want to become? The party of personal attacks and perpetual lies? The party that has delivered 50-plus years of promises to help the little guy, while continually making it worse? To my Hispanic friends, don’t be fooled by politicians on the left who pretend to care for you. Democrats held both the presidency and the Congress when Obama came into office, yet they did nothing to help you. As he departed, Obama threw you a bone by signing an executive order for DACA. He did nothing to reform immigration, a promise he made repeatedly. If anyone can fix this immigration mess, it will be Trump, pressuring Congress to work with him. There was a time when those of us of differing political beliefs and opinions could have a civil conversation, but now many of us don’t even attempt to understand one another. I challenge you to have a cup of coffee with someone who sees things differently than you see them, and seek to understand where they are coming from. A little empathy and a little respect will go a long way. Desiree Zapata Miller is president of the Mecklenburg (North Carolina) Evening Republican Women’s Club. She wrote this for the Charlotte Observer.